I often talk about the downfalls of resizing a brand new ring. Today I am going to do a summary of the key points so that you will understand a bit better why I go to so much trouble of making sure a new ring is made to the correct size. Most of the engagement rings I make are custom makes in some way. However this month I sold one of my already made engagement rings from the shop section of the website. The ring was a size P and without being able to measure the correct size it was more than likely going to be wrong. 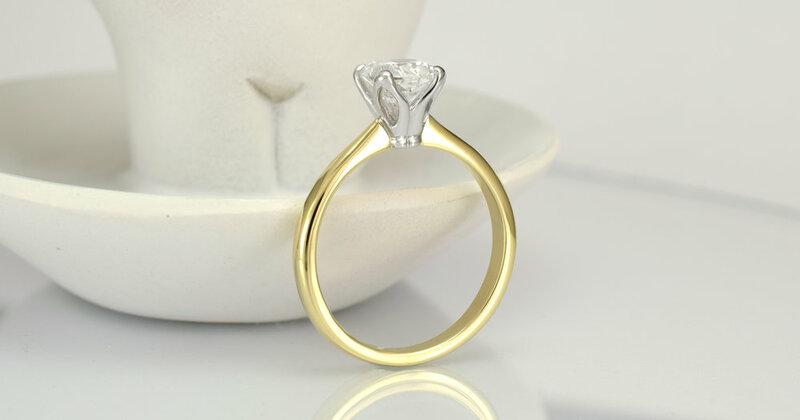 DR483 - 18ct gold alloys, .40ct main diamond with 2 x .125carat accent diamonds. The wrong size was no surprise. After the ring was used for the proposal we discovered that it was too big, way too big! The recipient of the ring came in and using generic sizers we thought that the correct size was a G, 9 sizes smaller. However as the generic sizers do not reflect the width and shape of the engagement ring, and this can effect the size required, I made up a sizer in silver that was the same width as the engagement ring. I met with the customer and modified that sizer until the fit was perfect. F.5 leading edge was her finger size. With all my custom engagement rings we do the design first. Then I make a draft, usually in silver, and after that is approved I make the actual ring. This gallery shows the process in 3 photos. The example is a remodel of a bridal set into one ring. With my in stock engagement rings however we treat that stock ring used for the proposal as a draft. If the size is incorrect we remake it to the correct size. This also allows for any small design changes that the recipient might want to make. The diamond in this engagement ring is a very specific GIA lab certified and laser inscribed diamond. We unset it and remade it into the same design but 9.5 sizes smaller. With the size P and F.5 rings side by side you can see the huge difference. It took me a little over a week after the proposal to remake the ring to the correct size. Size P and F.5 during the transfer of the diamonds. Shoulder settings of the diamonds. Most rings have a range to which they can be made larger or smaller. You want to save that for changes later in life to weight and knuckle/joint size. Resizing a brand new ring can use up all or some of that resize tolerance. It does not matter how good you are, resizing a ring damages it to some extent! Stretching and re finishing thins the ring out. Adding or removing a piece introduces joins to the ring and the required clean up also thins the ring. This is the reason why I make my rings thicker than those you see in the jewellery chains. That extra bit of thickness makes the ring stronger and is very handy for resizing. Stretching is more viable with thicker rings and when joins are required more metal surface results in a stronger join. Joins in thin rings tend to break. As a rule I like my women`s rings to be no thinner than 1.3mm. Most of the mens rings I make have a thickness between 1.6 - 2mm. This photo below is of one of my draft rings that I stretch and hammer into the correct size with little regard for its well being. You can see how the Euro style band really did not like being stretched and reshaped to the larger size near the corners. The fact that the ring is made out of scrap silver did not help but it does show what can go wrong. How do I surprise him/her with a custom ring? Remember my design, draft and make process? With customers that want a custom design to be just what the partner wants....... but still a surprise, we make a temporary ring for the surprise gifting. In the case of an engagement ring this is usually a simple solitaire that allows for the proposal and then for the couple to create their custom design together to exactly the right finger size. 1 carat cushion cut in a temporary ring. This does use up the draft stage but we still have the full design process that allows my customers to visualise the ring before its creation. There are many articles regarding this process in the News section.